As always we gather our energies to see where we are and how we are. Some of us are centred and some are scattered. At our gathering will cover your alignment to Spirit. There are many contradicting energies at play with this New Moon and New Year. We are wanting more of this and less of that. There does not seem to be a way of striking balance. Then we see that Aquarius is the water bearer who does not want to stay alone. The energy to serve mankind is strong around this time. Here is a story from the Labour of Hercules which demonstrates this very well. In the Labour of Hercules – the eleventh labour – we see Hercules cleansing the Augean Stables, where the dung lay uncleared for 30 years! He tells the King he will clean the stables for nothing. The King does not believe him. No one does anything for free. He challenges Hercules to clean the stables in one day and he will give him 1/10th of his cattle, but if he fails Hercules life and fortune will belong to the King. Hercules labours to divert the two rivers to create a rushing torrent which clears away the dung. The King is suspicious and says Hercules deceived him and refused to give him his reward and banished him from the land saying if he does not leave he will have his head chopped off. Charming! Hercules returns to his Teacher – he had saved a land from pestilence and been banished for doing so. The Teacher told him – A Server of the World you have become. How many times do we give unselfish service to others, participate in group work or self-sacrifice and are not thanked. This energy says Do not expect to be thanked for your work of kindness and care for others. How many times do you feel this energy? When I think about the energy of Aquarius, an Air sign, I always think of freedom, space and lightness of BEing. 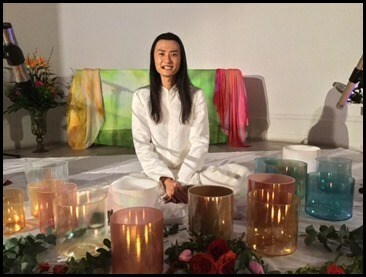 So I was very happy with myself when I realised that I had entered the energy with the bliss of sound healing from Yantara Jiro. Here you see me hugging him with joy and happiness. Sound is made by movement in Air. We move our mouths and we talk. We move our hands and we clap. We listen to musicians play fabulous notes and we feel inspired, healed, uplifted, held and supported. Thank you Yantara Jiro for the gift of you and the presence of you. Doing something new and different is a very New Moon thing. I was amazed at how I found myself doing so many new things. What new things have you done this year? The need for expansion with this energy is important, especially with all the resistance and rebellion around. When we put ourselves in a sacred space we allow ourselves to expand and get out of our own way. The Energy is friendly and inviting with the Aquarian. It is inclusive and collective. The Energy can shock you as they like to do something to shock. What behaviour has shocked you recently? Perhaps it could be the influence of the Aquarian energy? There is a need not to confirm to what they consider boring or old fashioned. They do not give straight answers and can appear cold and aloof. They make lovely homes. When they do decide to commit they commit otherwise they are surrounded by lots of ‘friends’. Aquarians like to work for humanity and believe in the collective good of the people. The desire to feel free, be independent, and not tied down or restricted is very strong with this energy. Aquarians make everyone feel important but there is nothing worse than you thinking you are important to them and then suddenly out of the blues turns attention to another person with the same interest shown to you. Welcome to the inclusive energy of Aquarius with the lovely New Moon. They can be unstable and unreliable but they do not mean to. So where have you be unstable and unreliable? Where have you been cold and aloof? You may find yourself scrutinising people and not trusting them. Though they have lots and lots and lots of friends they can be secretive about their lives. The Water Bearer likes everyone. Do you sometimes feel your Blood is heavy? Your heart feels heavy? This is because the blood is holding your memories. Blood carries memories. Sometimes the memories in the blood are not being released as you breathe out. They feel stuck and stagnant making you feel tired and overwhelmed. Perhaps you find it difficult to release a memory or you just choose not to because you like playing the old story over and over again like a repetitive record. i will be doing an exercise to help you release memories from your blood. We are awakened by the sound of the chicken every morning – it is punctual and reliable. It makes the call to wake up to live every morning. Self-assured. Talkative. Frank. Consistent and punctual. Rooster communicates loudly. There is nothing really subtle about Rooster, as Rooster is eccentric. Hardworking, Resourceful, Talented. Rooster makes noise – it sounds – it is seen – it speaks – it communicates – it lets you know it is here and is not going away. Every morning it gives a wakeup call: It says time to get up and face life – enough sleeping. Rooster urges mankind to make good use of the daytime and do something valuable. Rooster energy likes to be thought of as valuable and necessary. They like to think they create value in their lives and that of others. A kind Rooster is a very kind Rooster – especially to family and close friends. Rooster is loyal and true to friends and loved ones. They are loyal, energetic, intelligent, and honest to a fault. Rooster is sassy, very warm and showy. Rooster likes to be looked at and admired, likes to be around people who admire them; but if the people do not admire them, they will pretend not to care and go look for a new gathering of those who love and admire them. So yes, they like to be noticed and be the centre of attention. They are careful yet self-centred. Fire Rooster is alert, always alive and moving. It seeks opportunities and insights that lead it to practical results. Fire Rooster likes to complete a task and feel proud for doing so. They are alert and make good warriors and protectors of the land and the family. They will make a noise to warn others if there is danger nearby. They frighten with their noise. They are natural warriors or military people. They are committed to what they believe in. Rooster could be talkative or secretive. Rooster is sharp, precise, neat, organised and decisive. They are good with money. Fire Rooster can be fiery, impatient, and downright nasty. Boastful, arrogant, self-indulgent and selfish, Rooster will look you in the eye and tell you a lie. Full of their own importance they fail to realise what all the fuss is about. Rooster does not care and can be crude and rude. Brutally honest Rooter can kill Rooster are good at pretending, narrow minded, haughty, distant. Can live in a dream and be unrealistic! Can be self-absorbed and hedonistic. Rooster’s dreams will be big but they will disappoint a lot of the people e.g. partner, loved ones, etc. Rooster can be lazy and sleep the day away when it gives up and feels it cannot be bothered. Deep down Rooster may regret it and not show it. They do not suffer fools easily and are quick to judge and make themselves always right. They do not like to apologise or admit a failing or failure. Rooster promises more than what he can truly deliver or do. Sometimes they lack initiative and seeing the bigger picture. They are quick to point out the faults in others and do not like it when they are criticised. They are not sensitive to the feelings of others, so can appear callous and cold. Rooster is very opinionated, egoistic and abrasive. He is not as confident as he looks or sounds. He is just pretending to be in control or speak with confidence. He gives advice freely when it is not sought or wanted. 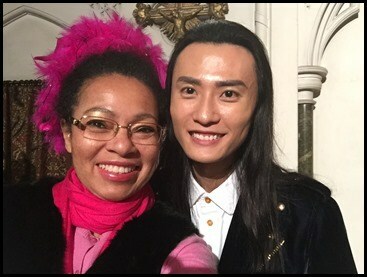 Rooster believes that advice given by him/her is perfect, whether or not it is asked for. This can make Rooster aggressive, as Rooster is very aware that Rooster is ALWAYS right and knows what he/she is doing!!!! Yoko Ono, Nancy Reagan, Joan Collins, Elton John, Pope Paul VI, Prince Phillip, Deborar Kerr, Yves Montand, Britney Spears, Justin Timberlake, Jennifer Aniston, Anna Kournikova, Anne Heche, Alexis Bledel, Bette Midler, Cate Blanchett, Diane Sawyer, Elijah Wood, James Marsters, Jessica Alba, Matthew McConaughey, Matt Damon, Natalie Portman, Taylor Momsen, Catherine the Great, Amelia Earhart, Rudyard Kipling, Michelle Pfeiffer, Serena Williams, Groucho Marx, Emperor Akihito, Barin Guy Rothschild, Peter Ustinov, Tagore, Roger Federer, Serena Williams, Mencius, Mo-tse, Liu Che (Emperor Wu of China’s Western Han Dynasty 202 BC – 9 AD), Li Longji (Emperor Xuanzong of China’s Tang Dynasty 618 – 907), Zhuge Liang (Premier of Shu in China’s Three Kingdoms Period 220 – 280), Eric Clapton, Beyoncé, Dolly Parton, Joan Collins, Benjamin Franklin, Jennifer Aniston, Bob Marley, J-Lo.